Wiwart, M., Bytner, M., Graban, L., Lajszner, W., and Suchowilska, E. (2017). "Spelt (Triticum spelta) and emmer (T. dicoccon) chaff used as a renewable source of energy," BioRes. 12(2), 3744-3750. 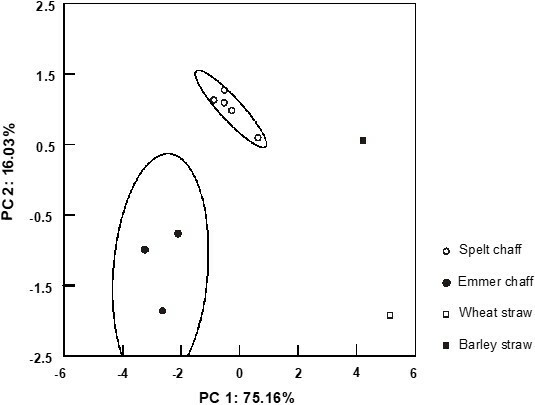 The energy values of spelt (Triticum spelta) and emmer (T. dicoccon) chaff were determined and compared to wheat and barley straw. The thermophysical parameters (moisture content, lower calorific value, gross calorific value, content of fixed carbon, volatile matter, and ash) and elemental composition (content of C, H, S, N, and O) of spelt and emmer chaff were determined. Spelt and emmer chaff were characterized by higher gross calorific value (18.75 GJ/Mg vs. 18.31 GJ/Mg), higher lower calorific value (16.74 GJ/Mg vs. 16.35 GJ/Mg), noticeably lower ash content (3.79% vs. 6.16%) and lower content of volatile matter (70.3% vs. 74.9%) than wheat and barley straw. Emmer chaff contained noticeably more sulfur (0.148%), nitrogen (2.20%) and hydrogen (7.50%) than both types of straw (0.064%, 0.66% and 5.55% on average, respectively) and spelt chaff (0.071%, 0.80%, and 7.06%, respectively). Despite the fact that the relatively high sulfur content in emmer chaff is not desirable, the results of this study indicate that the chaff of hulled wheat had considerable energy potential and that hulled wheats could be effectively used as renewable sources of energy in the region of their production. The significance of cereal straw for energy generation will probably increase in the near future due to the steady growth in the proportion of cereals in the cropping system (Gennari 2015). Spelt (Triticum spelta (L.)) is a hexaploid wheat that is closely related to common wheat (Triticum aestivum (L.)), whereas tetraploid emmer (Triticum dicoccon (Schrank)) is a close relative of durum wheat (T. durum (L.)) (Hammer et al. 2011). Spelt and emmer have hulled, non-threshable grains, which are characterized by high nutritional value (Galterio et al. 2003). They are more resistant to drought and fungal pathogens than common wheat, which increases their significance in agriculture, in particular in organic farming systems. Machine harvested emmer and spelt grain requires dehulling. On average, grain makes up approximately 70% of crop yield, and the biomass that remains after dehulling consists of chaff, glumelles, rachises, rachillas, and awns. This biomass is used as feed and litter in cattle and poultry production, and it can also be composted. Cleaned spelt chaff can be used as pillow filling. According to Tittlemier et al. (2014), the concentrations of mycotoxins in the by-products of wheat grain cleaning are extremely high. In the “light dockage” fraction that contains dust and roughage, such as glumes, fragments of stem, or rachis, the mycotoxin concentrations can reach up to 32 mg/kg of deoxynivalenol, 0.532 mg/kg of zearalenone, and 0.249 mg/kg of ochratoxin. The content of deoxynivalenol, the most common Fusarium toxin, and ergosterol (a quantitative indicator of fungal biomass in plant tissues), can be five times higher in spelt chaff than in spelt grain (Wiwart et al. 2009). For this reason, the material left after grain cleaning and dehulling should not be fed to animals, and it could be more rationally utilized in the production of energy. Jovičić (et al. 2015) reported that spelt biomass can serve as a renewable source of energy. According to Brlek et al. (2012), the biomass remaining after spelt dehulling can be pelleted. The objective of this study was to determine and compare the basic energy parameters of the by-products of spelt and emmer dehulling with those of wheat and barley straw. This experiment is the first and, currently, the only study to investigate the value of biomass obtained after grain dehulling of two hulled Triticum species for energy generation purposes. The material used for this experiment was the biomass that remained after the dehulling of grains of five Spring spelt breeding lines (UWM10, UWM11, UWM12, UWM13 and UWM14) and three emmer breeding lines (P1, P2 and P3). All breeding lines were developed at the Department of Plant Breeding and Seed Production of the University of Warmia and Mazury in Olsztyn, Poland. The field experiment was conducted at the Experimental Station in Bałcyny, Poland (53°36 N, 19°51 E). Before sowing, the experimental plots were fertilized once with nitrogen/phosphorus/potassium at the rate of 40/25/80 kg/ha, respectively. The plots, with an area of 11 m2 each, were sown with whole spikelets at a rate of 135 kg/ha. The harvested grain was dehulled in the LD 180 laboratory thresher (WINTERSTEIGER AG, Ried im Innkreis, Austria). Wheat and barley straw from plants grown under identical conditions was used as the control. Laboratory analyses were performed on air-dried biomass. The biomass was ground in a MF10 mill (0.25-mm mesh, IKA® Werke GmbH, Staufen im Breisgau, Germany). All analyses were conducted in three replications. The weight of a pooled sample was 200 g.
Moisture content was determined in 5-g samples, dried to a constant weight at 105 °C ± 1 °C. The content of ash, volatile matter and fixed carbon was determined in the Thermostep thermogravimetric analyzer (ELTRA GmbH, Haan Germany). Samples of approximately 1.50 g were placed inside the analyzer where the temperature and atmosphere were controlled automatically. The analyzer temperature was set to 650°C (nitrogen atmosphere) for volatiles and 600°C (oxygen atmosphere) for ash. where Qs is the LCV (J/g), Qs is the GCV (J/g), W is the moisture content (%), and 0.02443 is the enthalpy of water vaporization. where O is the oxygen content of the sample (%) and A, C, H, Sc and N are the percentages of ash, carbon, hydrogen, sulfur and nitrogen content in the sample, respectively. The results were processed by analysis of variance (ANOVA), and the mean values were compared by the Student–Newman–Keuls multiple comparisons test. A principal component analysis (PCA) was performed for all of the analyzed parameters, separately for thermophysical parameters and elemental composition. The results of all measurements were processed statistically using STATISTICA software (StatSoft Inc., Version 12, Tulsa, OK, USA). The average moisture content of the straw was 9.44%, and emmer chaff was characterized by a somewhat higher moisture content than spelt chaff at 10.03% and 9.01%, respectively (Table 1). The average gross calorific value (GCV) of chaff was 18.65 GJ/Mg, ranging from 18.42 GJ/Mg (UWM 14 spelt) to 18.99 GJ/Mg (P2 emmer). The GCV of emmer was somewhat higher compared to spelt (18.83 GJ/Mg and 18.66 GJ/Mg, respectively), but both values were noticeably higher than the GCV of straw by 2.8% and 2.0%, respectively. A similar, but less clearly accentuated trend was observed in lower calorific value (LCV) values which were 2.1% and 2.6% lower in straw than in emmer and spelt chaff, respectively. The results were difficult to analyze because the utilization of spelt chaff as a renewable energy source has only been discussed in a single paper to date, and there is a general absence of data concerning emmer chaff (Brlek et al. 2012). The moisture levels noted in the present study were somewhat higher than those reported by Brlek et al. (2012) (8.13%), but remained within the range of values given by Allica et al. (2001) (from 6.77% to 13.99%), and were similar to those reported by other authors (Friedl et. al. 2005; Kargbo et. al. 2010; Greenhalf et al. 2012). McKendry (2002) determined the LCV values for wheat and barley straw at 17.3 GJ/Mg and 16.1 GJ/Mg, respectively, whereas the LCV value of spelt chaff reported by Brlek et al. (2012) reached 17.114 GJ/Mg. The LCV values were slightly higher than in the present experiment. The ash content of chaff ranged from 3.35% (P1 and P2 emmer) to 5.82% (UWM14 spelt). For wheat and barley straw, these values were higher by approximately 22% in comparison with spelt chaff, and by 39% in comparison with emmer chaff. In a study by McKendry (2002), ash content was 4.0% in wheat straw and 6.0% in barley straw, and according to Friedl et al. (2005), the ash content of combined wheat and barley straw could reach 3.9%. The average volatile matter (70.46%) content of chaff was noticeably lower compared to straw, and emmer chaff contained less (69.65%) volatiles than spelt chaff (70.95%). A reverse trend was noted in the content of fixed carbon, which was lowest in both straws (on average 18.94%) and highest in emmer chaff (26.60%). These results correspond with the data reported by Greenhalf et al. (2012), Allica et al. (2001) and Wang et al. (2009). These authors reported that the fixed carbon content of different straws ranged from 15% to 19.5%. The results of the elemental analysis are presented in Table 2. The carbon content of chaff samples averaged 51.80%, which was remarkably higher compared to straw (46.7%). The content of hydrogen was higher in chaff than in straw, whereas sulfur content, an undesirable biomass component, ranged from 0.064% in spelt to 0.160% in emmer. Sulfur content was more than twice higher in emmer chaff than in wheat and barley straw, which undermined the usefulness of T. dicoccon biomass for energy generation. Biomass used for energy generation should not be characterized by excessive nitrogen levels which contribute to high NOx emissions. On average, nitrogen content was 0.80% in spelt chaff, 2.2% in emmer chaff, 0.55% in barley straw, and 0.77% in wheat straw. The PCA of all evaluated traits strongly discriminated between the analyzed objects, and PC1 and PC2 explained 91.19% of the total variance (Fig. 1). The parameters that determined the energy value of the biomass most effectively discriminated between spelt chaff, emmer chaff, wheat straw, and barley straw. Interestingly, GCV and LCV were the least discriminating traits (Table 3). Spelt chaff was characterized by the most desirable elemental composition. The movement of points that corresponded to emmer in the direction of negative values of PC1 and PC2 resulted mainly from the high content of sulfur and nitrogen in chaff. The findings in this study indicate that the examined emmer and spelt biomass was generally more appropriate for energy production than wheat and barley straw. Emmer and spelt chaff could be used as renewable energy sources in regions where those crops are grown. Brlek, T., Bodroza-Solarov, M., Vukmirovic, D., Colovic, R., Vuckovic, J., and Levic, J. (2012). “Utilization of spelt wheat hull as a renewable energy source by pelleting,” Bulg. J. Agric. Sci. 18(5), 752-758. Gennari, P. (2015). “FAO Statistical Pocketbook. World food and agriculture,” Food and Agriculture Organization of the United Nations, Rome, Italy. ISO 1928 (2009). “Solid mineral fuels- Determination of gross calorific value by the bomb calorimetric method and calculation of net calorific value,” International Organization for Standardization, Geneva, Switzerland. Jenkins, R. G. (2014). “Thermal gasification of biomass- a primer,” in: Bioenergy, 1st Edition. Biomass to Biofuels, A. Dahiya (ed), Academic Press, Amsterdam, Boston, Heidelberg, London, New York, Oxford, Paris, San Diego, San Francisco, Singapore,Sydney, Tokyo, pp. 261-286. Jovičić, N., Matin, A., and Kalambura S. (2015). “The energy potential of spelt biomass,” (in Croatian) Krmiva 57: 23-28. Kargbo, F. R., Xing, J., and Zhang, Y. (2010). “Property analysis and pretreatment of rice straw for energy use in grain drying: A review,” Agric. Biol. J. N. Am. 1(3), 195-200. Article submitted: November 28, 2016; Peer review completed: March 3, 2017; Revised version received and accepted: March 28, 2017; Published: April 4, 2017.